Kleenex® Brand Kleenex® Wet Wipes* - Sensitive Hand Wipes with Aloe Kleenex Wet Wipes Sensitive are fragrance and alcohol-free. Made for sensitive skin, these wipes gently clean your hands and face while on-the-go. 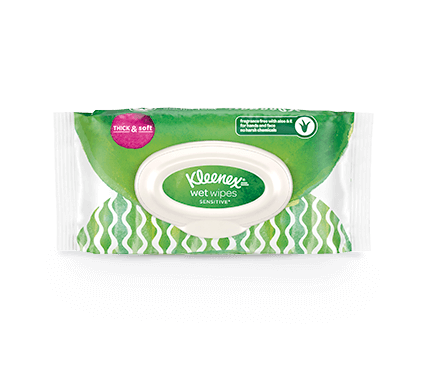 Kleenex® Wet Wipes* Sensitive With Aloe and Vitamin E for Hands and Face is rated 4.7 out of 5 by 445. Rated 4 out of 5 by mcdiverest4 from Pretty good These wipes are pretty good! Definitely didn't irritate my skin or my son's skin, and he is highly sensitive to cleansers. Got a lot of the gunk off that we needed but I'd rather they were all natural. Rated 4 out of 5 by Gingesweet9 from Very durable These wet wipes are very durable while cleaning up messes. They do not fall apart while scrubbing surfaces. Rated 4 out of 5 by Joliver4 from Good for sensitive skin These work good but I'm not a big fan of them I like the other wipes better. These just don't feel very wet. And I don't have sensitive skin so I'm not worried about any irritation. Rated 4 out of 5 by Grimcarl9 from Kleenex Sensitive wet wipes review. These wipes worked well and they weren't too wet and didn't leave a sticky film. Overall good product. Rated 5 out of 5 by Predia5309 from Sick and sensitive kids These wipes came in at a very handy time. My children were sick with the flu and my daughter has very sensitive skin. I used the Kleenex wipes to keep her mouth and hands clean and germ free. She never once broke out in a rash and she was able to recover fully from the flu. Rated 5 out of 5 by jendex799 from Convenient and cool! These were soft and had the perfect amount of moistness to them. I really liked that they are made for sensitive skin, because I used them for my dogs feet and on their faces. It didn't irritate them at all. They are perfect for on the go and in your car! Rated 1 out of 5 by Avlkyr1 from Sensitive yes, Clean no I really wanted to like these, but I just don't. They don't clean well at all, and even though they feel okay on sensitive skin, they are ineffective and leave a coating-like residue on my hands and face. After using them on my face and hands, I don't feel clean nor refreshed. They're not flushable either, so using them "on the go" isn't really attainable. They don't pick up spills well, and after cleaning my cat's vomit (and an incident where he missed the litter box), I had to wash my hands, both times because the nastiness went right through where a paper towel would not have. Rated 5 out of 5 by MommieMich907 from Gentle But Tough I love how well these wipes work as well as how good they smell. They get the job done for dirty hands and faces. Rated 5 out of 5 by cdrawls1 from great facial wipes These wipes are for sensitive skin but are strong on power. Rated 4 out of 5 by JJ1232 from Great Wipes! I really like the Kleenex Wet Wipes Sensitive. They are soft, thick and made for sensitive skin. Rated 5 out of 5 by Anglswt4695 from Sensitive yet durable The softness of these wipes are amazing. They are still durable though. The Aloe leaves your skin soft after each use. Rated 5 out of 5 by kcsr04263 from A wipe for today's needs In My opinion the Package Size is perfect for on the go! I have one in the car, one in my toolbox, and one at home. plus the wipes themselves were nice and soft but durable enough to clean my tools without falling apart! and they smell good! Very Good product! Thank You for the trial! Rated 4 out of 5 by Ragamonster2 from Deep clean They provided a really deep clean but tore easily. I used them for the bathroom. Rated 5 out of 5 by Tester233 from Many possible uses Gets your hands (and face, body, etc) clean without irritating skin. Rated 3 out of 5 by Olly551 from Sencitive indeed Everything was fine , except the packaging could be improved .... whenever I was trying to first open the pouch ... the whole bag wripped. Rated 5 out of 5 by armyguyinpa4 from great for those tender spots i tried these wipes on my more sensitive areas and they cleaned very effectively but left me feeling nice. There was no excess moisture like with other wipes and there was no irritation after several uses. They were pleasant smelling and definitely left me feeling clean after. Rated 5 out of 5 by Tija8 from Great for removing make up! Feels good, gets the job done. Perfect wipes to remove makeup. Leaves no nasty residue feeling. Squeaky clean! Rated 4 out of 5 by Mar556 from Perfect for sensitive skin, yet durable These wipes were very good. They were perfect for sensitive skin/areas. They would not irritate the skin. They were also thick enough so they would not come apart while being used. Rated 4 out of 5 by Willster4596 from Clean without dry skin. Great wipes that make your hands feel clean without drying out your skin like many other wipes do with heavy use. I feel that I can use these wipes as much as I need with no need to worry about how clean my hands are or that if I use it too much that it will dry out my skin. After using, my hands feel clean and moisturized and would definitely recommend this product. Rated 4 out of 5 by Christina4313 from Sensitive kleenex I love that Kleenex offers a sensitive branded wipes because my daughter is extremely sensitive when it comes to her skin and they are gentle enough to use on her! Rated 5 out of 5 by jillybean7 from I never knew until i had tried them. These are extremely covenant and awesome products. They are one of those products that you don't think you need until after you have tried them. You don't realize how much you need them until you no longer have any. They don't dry out your skin and are just a great thing to have on hand. They bring a piece of mind when life happens and you can quickly deal with it and move on to important things. Rated 5 out of 5 by ynotretism1 from Plesently surprised. Not being a regular wipe user, I found my experience in testing these wipes ,eye opening. I was finding reasons to use the wipes and loved it . And my hands loved it to . I think they feel softer as a result. Rated 5 out of 5 by Deanne5 from Leave my skin felling soft! I like the package that these wipes come in because I can close them when I’m not using them. They remove death sk8n and dirt from my skin, but doesn’t strip my skin like other Wipes can do, they leave my skin felling soft from the aloe and vitamin e. I like the they are thick , large, but also soft. These are great Wipes! Also these work great on my husbands skin and his skin is very sensitive and they didn’t irritate his skin at all. Rated 5 out of 5 by RasheedDC2 from Truth Awesome product you have to try these! They are awesomely gentle yet clean away grime without irritation to your skin!